Font d'Urle is in the middle of nowhere, yet easy to reach! Totally natural setting. Enjoy the wide open spaces, nature, silence, walks on the high plateaus. 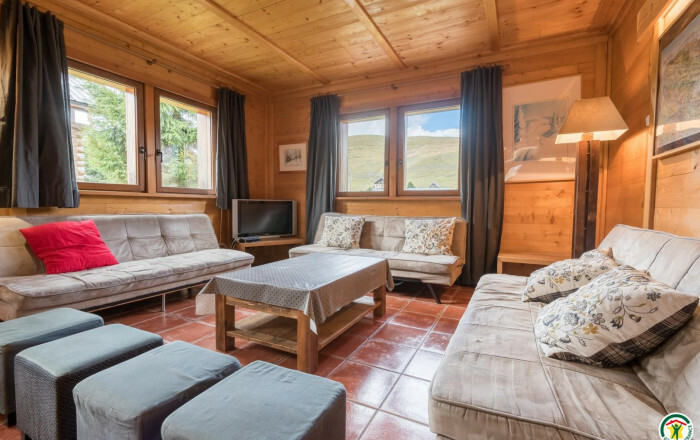 This traditional wooden chalet with modern touches is perfect for a relaxing holiday. Ground floor: kitchen opening onto living room and lounge, shower room/WC, lobby for skis and outdoor equipment. 1st floor: 5 large bedrooms (queen-size bed) (queen-size bed) (2 single beds) (2 single beds) (3 sets of single bunks), shower room, separate WC, dressing room. Christmas/New Year week: 2,350E. Contact owner for rates not displayed. Très beau chalet, très bien équipé, très bien chauffé pour ce premier weekend de neige. Propriétaires très disponibles. Nous sommes très heureux d avoir pu nous retrouver dans ce lieu.